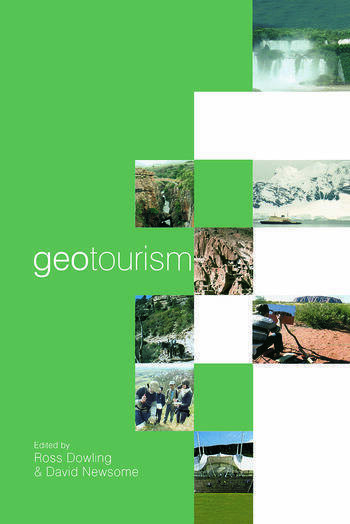 Geotourism is tourism surroounding geological attractions and destinations. This unique text uses a wealth of case studies to discuss the issues involved in the management and care of such attractions, covering topics such as sustainability, impacts and environmental issues. Geotourism: Sustainability, impacts and management leads the reader logically through the process, covering both the theories involved and the practicalities of managing such 'environmentally precious' attractions. Contributors. Editors. Preface. Acknowledgements. The Scope and Nature of Geotourism, David Newsome & Ross Dowling. Part 1 – The Resources for Geotourism; Geotourism in Malaysian Borneo, Felix Tongkul. Geotourism in Potential of Southern Africa, Wolf Uwe Reimold, Gavin Whitefield & Thomas Wallmach. Geotourism in Australia, Jane James, Ian Clark & Patrick James. Geotourism in Resources of Iran, Alireza Amrikazemi & Abbas Mehrpooya. Part 2 – Geoparks; Geoparks: A Regional, European and Global Policy, Marie-Luise Frey, Klaus Schafer, Georg Buchel & Margarete Patzak. Geotourism: A Perspective from South-West Germany, Christof Pforr & Andreas Megerle. Geological Heritage in China, Jiang Jianjun, Zhao Xum & Chen Youfang. Part 3 – Geotourism in Action; Geotourism: A Perspective from the USA, Alexander Gates. Geotourism in Ireland and Britain, Patrick McKeever, Jonathan Larwood & Alan McKirdy. Geotourism in Spain: Resources and Environmental Management, Jose Calaforra & Angel Fernandez-Cortes. Geotourism and Interpretation, Thomas Hose. Geotourism’s Issues and Challenges, David Newsome & Ross Dowling. Appendix 1.